Mention the Washington Monument and most people think of Robert Mills’ marble obelisk on the National Mall. But another Washington Monument is stealing some of the limelight this year, thanks to a milestone anniversary and a recent restoration. The Washington Monument in Baltimore, also designed by Robert Mills, is considered the first monument to the nation’s first president. Construction started in 1815 and was largely completed in 1829, making it several decades older than the D.C. monument. 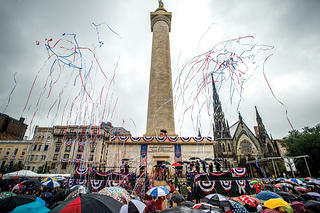 Baltimore’s version reopened after a $5.5 million restoration on July 4, 2015, exactly 200 years after the cornerstone was laid. The restoration was the first major project completed by the Mount Vernon Place Conservancy, a nonprofit group that formed in 2008. The conservancy embarked on a double-pronged effort to bring the 19th-century landmark into the 21st century. One objective was to improve the structure’s physical condition. At the same time, the conservancy took steps to make people aware of the monument through social media and other means, giving it a Facebook page, YouTube videos, and a website. Baltimore’s 178-foot-tall monument is a classical Doric column atop a stone base, with a statue at the top by Italian sculptor Enrico Causici. Visitors can climb 227 steps to enjoy unobstructed views. The monument closed in 2010 after an engineering survey revealed potential structural flaws. Repair work included washing the stones with a nonabrasive detergent and resetting parapet walls; replacing exposed iron pins with stainless steel pins where possible; repointing every mortar joint; re-stuccoing the gallery inside the base; and rebuilding the four stone entrances to the gallery level. We explore four buildings designed by one of America's first native-born architects, Robert Mills.